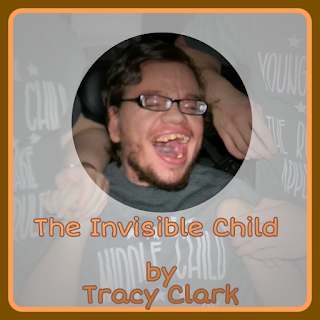 Now you're probably wondering, what exactly is an invisible child? Well it is a child who lives, breathes, eats, plays and seems to exist only in the eyes of one person, their mother. I am reminded of this so poignantly on this day of my son's birthday party. Family enters into my home, say their hello's to him, a random happy birthday, then proceed on to making themselves comfortable, through food and pleasantries of chitchat. I watch with wounded heart, as my sister in law plays cars with my youngest son, my mother in law completely engrossed in my daughter's puzzle alone side her, and I watch a little boy in a wheelchair, sit quietly playing with his chosen toy. I ask him what he has and he smiles so wide at me, I can tell he is just happy someone is speaking to him, though he does not comprehend my words, he goes back to his toy. It is time for cake and song now, and my husband becomes suddenly dumbstruck as to why I want him to show our child the cake. It is a character he is familiar with, he enjoys and smiles quite readily at, but my husband is a closet affectionate when it comes to our son. Completely beside himself to talking to our child, as opposed to his usual prompting our son with the same questions over and over, because he doesn't know what to talk to our son about. And this is done only after I have browbeaten him on why he never talks to him in the first place. You see I can carry on an entire conversation with my son, though he never utters a word in return. But the look on his face tells me he hears me as he bats his long lashes at me, humoring me with a large grin. I hear every word he cannot say, and both of us know that. Cake is now served, and as I am cutting pieces, I'm asked the same dumb question I am asked at everyone of his parties, "Why didn't you make chocolate?" my answer simple, "He doesn't like it", to which the response in common is "So he doesn't understand that". I fed him chocolate cake once and he spit it out, I fed it to him a second time with the same results. Then on a spur I happened to make a strawberry flavored one, he took the spoonful, chewed it around, swallowed and proceeded to open his mouth wide wit that 'next bite please' look about his face. Now is this not the same philosophy with a speaking child, feed once, child says yuck, feed twice, child says yuck, try something different, child says "more please" someone please tell where the difference lies, other than vocal clarification. So I watch as my family members sit around in discussion of every and all things, and I watch this little boy beside me in quiet bliss. staring at his favorite hand. Does no one see this child here? Has everyone forgotten this is HIS day? Again I speak to my son, tell him how big he is getting, seven whole years old, I make it a point to raise my voice over others, to try and drive my point in. Deafness seems to have set upon all their ears. My son is trapped in a body that does not work to others likings; he cannot talk, because they will not listen. He dances to the beat of a drummer only he and I seem to be able to hear, he knows you are there, did you not understand his smile when you said hello? No you did not see his smile, because you only think he does not understand. The party is done; I have fed him his cake, to which he has gleefully squawked through, covering myself, him and his toys, in a spatter of cake and frosting. His presents have been opened through hurried remarks of ..."Just open it for him", while I was delighting in his wonderment as he touched the crinkly paper. He was wonderful in his tracking of new toys and clothing as I showed him each piece, through exasperated breaths of family. He gladly smiled upon an object he enjoyed, and heroically attempted to at least grab in the general direction of the toy. Yet only I delight in these small yet precious moments of his greatest feats, to the rest he is invisible. People gather their coats and belongings; trinkt presents are given out to our other two children of the house, and they are readily lavished with affection as they squeal with joy. My sister in law, says goodbye to my son with a pat on his arm; my mother in law at least kisses his cheek, but turns away before she can see his expression of happiness, and in the blink of an eye, the day is done. As I scurry about the house chatting him up about his day and his gifts, he yawns and leans wearily to one side of his wheelchair. I can see the weariness take over his tender face, and I cannot help but think, is he weary from the day? For only I know the true work and effort he has put forth on this special day of his. Or perhaps he is weary in spirit, to know he has tried so wholeheartedly to express to others, that which I already know. Only he knows for sure, and he will forever be privy to those thoughts, which resound within the depths of his mind. I can speak for myself when I say, I understand the mind of an invisible child, I take the pain, because I understand it, I take the heartache, because I live it. But I also take him, as his is, an invisible child to all but me. To me he is the greatest treasure still yet to be discovered. So who in the end is more handicapped? 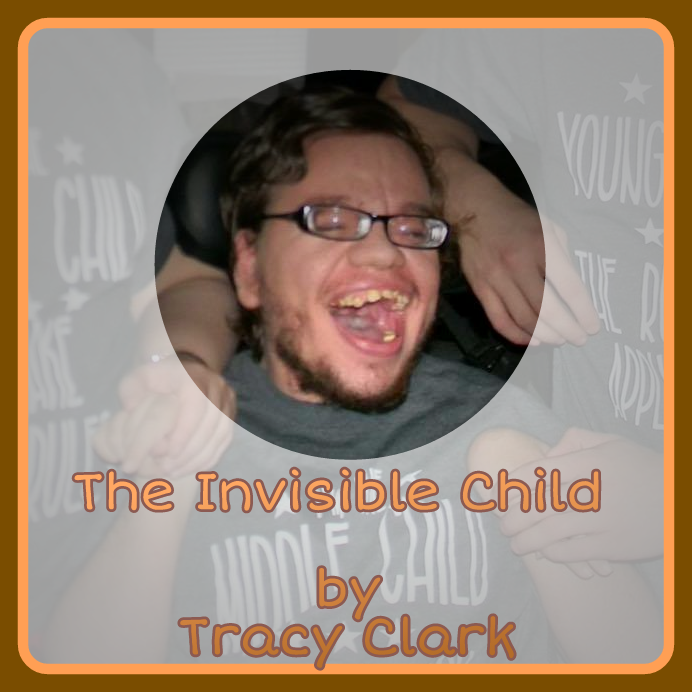 The person who makes the child invisible? The person who makes the child invisible is handicapped. It takes great love & compassion to communicate with someone who is not using English or our 1st language. In tutoring handicapped children I needed a "cheerleader" of sorts to convince me I was making a difference & to not give up. I love your blog & hope you will write more.